In Metal Gear Solid 5: The Phantom Pain, the latest and final part of Konami's successful Metal Gear series you can make all sorts of adjustments to your weapons. Especially, the Mother Base, you can expand and decorate the way you want. But an option for weapon customization is missing! The reason is you lack the appropriate expert! You need a clever Armorer / Gunsmith, which is equal to the task. The guy is constantly in trouble and you need to free him three times out of captivity. 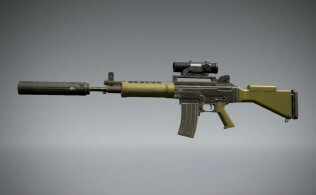 In our guide, we show you how you can unlock the weapons customization option. - Complete Side Operation 107 to extract the legendary Gunsmith (I) first time. - Complete Side Op. 108 to extract the legendary Gunsmith (II) second time. - Complete Side Op. 109 to extract the legendary Gunsmith (III) third time. Once you've freed the legendary Gunsmith three times, you have all options for weapons customization available. You can create three per weapons category specially Boomstick and store for use. Modified weapons you recognize in the preparation for use while on the yellow font. Through the development of weapons you unlock new accessories free, which are allowed to combine freely with each other. Also visual changes you can adjust by different colors. See a list of all components that can be combined with each other free, provided that they are compatible with each other. In addition, you can see how each adjustment parts that affect the behavior of weapons. - Base: The base is always the original weapon model without the frills. - Run: The run has an impact on the rate of fire and range. It also influenced the shot image and other targeting aids. - Magazine: Clip size and maximum amount of ammunition can be modified. - Shaft: The shaft of the weapon determines how quickly you can fire back after a shot. - Muzzles: Here brings various models of Muzzles. - Muzzles Accessories: This includes silencer and improvements to the shot. - Optics 1: Here's a red dot sight or a simple rifle scope with zoom levels. - Optics 2: A telescope with more foresight. - Lamp: A lamp illuminates the darkness and hidden enemies. - Laser sighting: With a laser sight you can targets accurately. - Underflow: Post as attach a handle with which you shoot more accurate and stable your resource. Furthermore, you can also mount a grenade launcher.